Today I am swapping with Crystal, so check her out, and then come over to her blog and say hi and see all the fun stuff she has to offer! Hi Everyone! 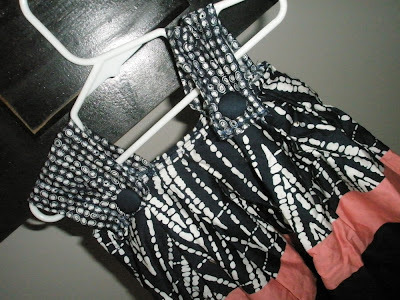 I am so excited to blog swap with Tiffany today. I just love her blog and great crafts. I am a stay at home mom of two adorable little girls (4 and almost 2). They keep me very busy. When they are awake we spend our time playing, learning, making messes, and occasionally cleaning. 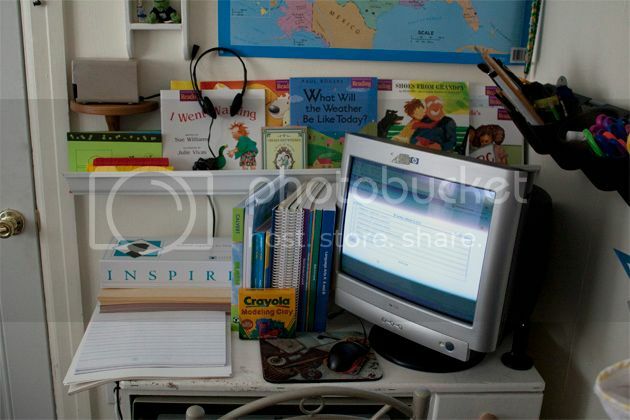 I teach my daughter preschool at home and we post our fun activities and crafts on our preschool blog. Come by Crystal's Craft Spot anytime for more crafts and tutorials. Thanks again for letting me stop by. Its been a lot of fun! This one is all about the crafts. Question #1: If you had to save only 1 crafty items you've ever made, what would it be and why? Well this one is actually easy, (if I don't count the things I've made for my kids-because they would be devastated if I threw out some of the things I've made them). 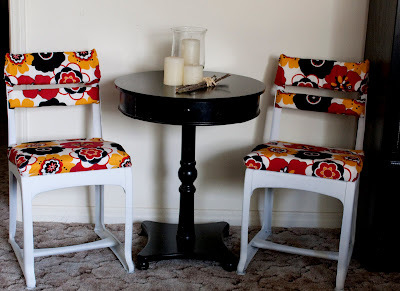 But if I could only save one of my crafty things I've made for me it would be these chairs. My free off the side of the road ugly school house chairs made into these lovelies. They make me happy every time I see them and every time I sit in them. I know they are not sentimental in anyway, but I love them. Question #2: Do you have a particular craft that seems to fit you perfectly and that you would love to devote most of your creative energy to? Another fun question, that was easy to answer. The problem is I don't spend any time on my favorite creative thing to do. I LOVE to draw, but because it is time consuming, and not really a tutorial I could do every week, I focus on other crafty things. I only have time for so much these days, but I know when my kids are a little older and a little less clingy, I will be able to focus more on my art of choice. Question #3: Is there a craft/technique that you find harder than others? My nemesis is sewing, as much as I love to sew things for my kids and do the few things here and there that I do, I am not great at it. Me and my seam ripper have a love/hate relationship and it is usually leaning more to the hate side. I can NEVER seem to get my tension and stitch length just right, and I am always having to go back and re-do things that I just did. Frustration for sure, but I want to be better at it, I want to be able to make my kids cute things that they wouldn't be laughed off the street wearing, (maybe it's a good thing I homeschool them). Anyways-working on it, getting better at it...slowly. Thanks for these fun questions! Be sure to come back tomorrow to meet my new bloggy friend, she's got some great stuff to show you! I am looking for some awesome blogs to swap with for the next few months, contact me if you would like to swappity swap on an upcoming Friday! I have lowered my advertising rates to just $5 a month! I would love to help promote your business for March. Contact me if you are interested. Sorry to bore you with business, now lets get down to business...the yum yum's! I am craving something sweet today, and these sounded delish. My friends and I used to always go to TGIFriday's for Oreo Madness when we were in high school-and it was my ultimate favorite dessert. Unfortunately they don't have it anymore, so I wanted to make my own version in an individual serving size. 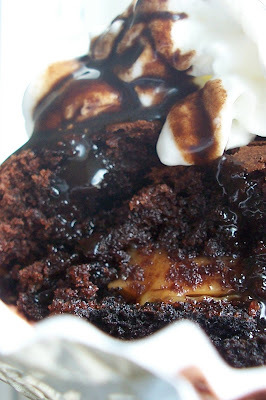 I made these about 10 years ago and has been one of my favorite go to desserts ever since. 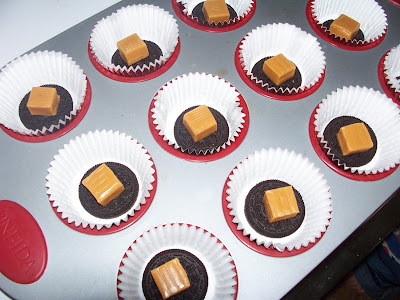 Start by lining your cupcake tins and adding 1/2 an Oreo cookie to the bottom of each and then add a caramel to the top of those. 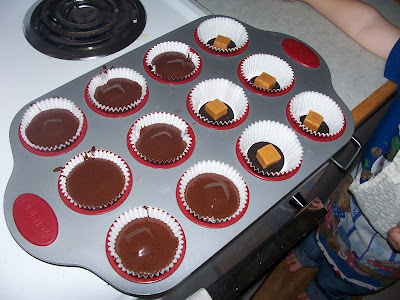 Then you make brownies-use your own favorite recipe or box mix. Top with spray whip cream and a drizzle of hot fudge. About 5 or 6 years ago my more than amazing sister in law had a birthday party for her son and my step son was one of the lucky invited. It was a pool party and all the kids came home with a pair of goggles and a swim toy and one of these awesome towel poncho's. To this day, my step-son (now 13) loves it and wears it whenever we go to the pool. So finally I picked up some supplies and made one for my almost 4 year old, and will be making some for the other kids soon. The supplies? One towel and one wash cloth. First you fold your towel in half length wise. 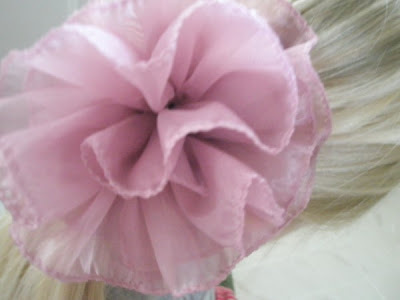 On the fold, in the center cut a straight line big enough for your child's head to easily fit through. Next fold your wash cloth in half. Cut it in half. Half of it will be a pocket, and half of it, cut into an initial, (you could also do a fun shape or design, but I am just doing the monogram). Next using a closed stitch, sew around the neck hole you made to keep the towel from tearing any further. Next pin on and sew on the pocket down both sides and the bottom. 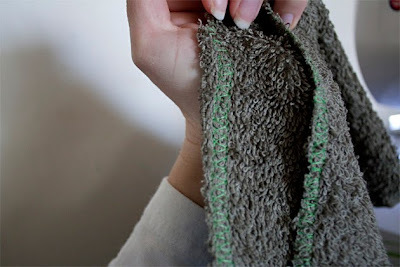 Be sure to leave the top part of the pocket the finished side of the wash cloth for a cleaner look. Next pin on and sew on the initial. If it wasn't February, then you could stick some goggles and a stick of sunscreen in the pocket and send them out to play by the pool. But since it is, let them wear it with their footy pajamas while they eat grapes and watch a movie. 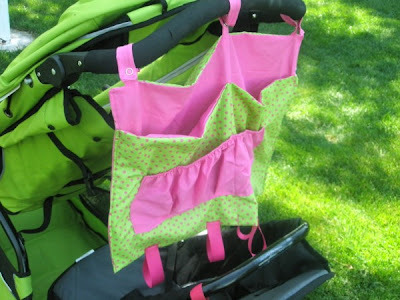 Way more sophisticated than a hoodie towel for the "big" kids, and they can run and play in them after they are done swimming. Time to show off what you've been working on. I am guest posting over at 733-A Creative Blog today. She is hosting a Creativity Week-with guest posts and...giveaways!!! Then link up your projects here. Don't be bashful...share this button on your blog, and let everyone know that you made the world cuter today! How fun that it's Friday! I am swapping with Bobbie today-and I couldn't be happier! She has had such fun projects lately that make me want to pull out my sewing machine-and the project she is sharing today is so dang cute! 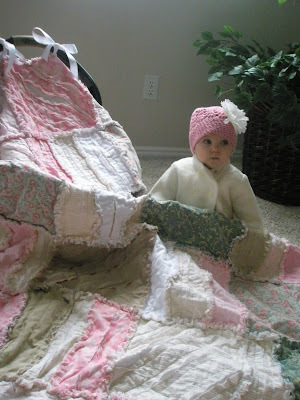 I want to make them for all of my cute little nieces! Hello! I am excited to be blog swapping with Tiffany today. 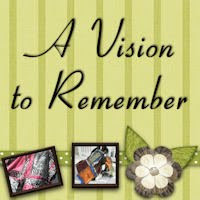 I am Bobbie with A Vision to Remember by I am only 1 woman. I also make clothing for my 2 girlies a lot. Today I am going to share with you a simple thing you can do with metal or wooden letters. Glue the beads to the letter. I found that the best way to do this is to outline the letter with the beads, then fill in rest of the letter. Spray paint the letters (and yes I could not wait til spring to do this :). I used regular spray paint and it started to peel off. I would recommend using plastic spray paint so this does not happen to you. You could also prime them first. Now you have some really cute letters. Now what to do with those really cute letters? I hope to see you around! Thanks again for swapping blogs with me and I hope to see you all on Saturday for the Check me out saturday link party! Thanks for all the fun questions for my Q&A. I decided to split them up into categories, so that I could give an adequate response for each question. This week I will focus on the questions about Homeschooling. Question 1: Why did you decide to Homeschool? The first notion I had to do it, was when I was in my sister-in-laws amazing school room with her time line that I loved and saw how absolutely great her kids were (and still are). There wasn't any of that social weirdness that I was certain all homeschooled children had, in fact these kids had tons of friends, lots of time to pursue the things they were interested in and were best friends with each other. The family got to go on all sorts of fun trips and not have to worry about missing school-they just incorporated school into their lives rather than their lives into school. 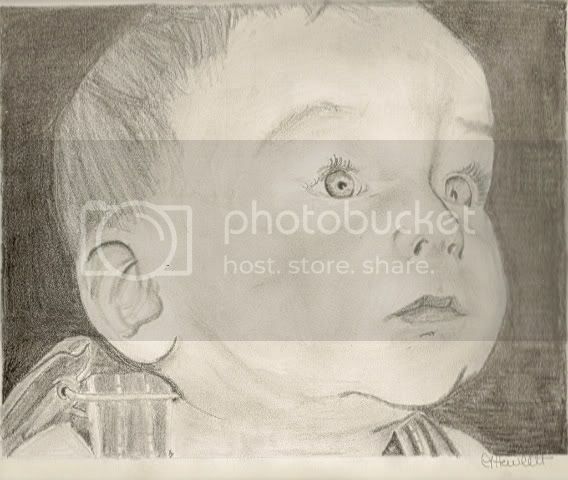 My oldest was a baby when I started thinking about it, and I didn't give it much thought after. Then when my Bekah went into preschool, I once again thought about homeschooling because of how going to school changed her. Nothing drastic, or even all that bad. It's just that she started doing things that kids do, that I wasn't ready for. She started caring about who was "first" to do something or who had the biggest or the most. She started saying to her little brother when she didn't get her way..."then I won't be your friend." Now granted these things were probably all inevitable, but at 3 I felt she was a little young to be acting this way. Plus she would come home and say words that were "bad words" at our house, like dumb, shut-up and stupid. Argghh. That wasn't all though. When I would go to pick her up from pre-school, I would have to wait most days for 20 or more minutes while she finished her project. My daughter is a perfectionist (wonder where she got that huh?) and school just moves so fast. They would spend 10 minutes on art, 1o minutes on a worksheet, 10 minutes on story time, which is what you have to do in a room full of 3 year olds. But Bekah would get anxious because she was trying to cut something out on the lines, or glue her hair on her puppet just so. I felt that being a perfectionist and taking time to do something that is important to her was something I didn't really want her to lose, just so that she could move on to the next thing. I am not worried about her social skills one bit, we have plenty of play dates with lots of friends, she goes to church every week, and ballet and tap once a week, and we are in a pre-school group that does field trips once a month-and honestly what school does field trips once a month? Finally for my own selfish reasons, I REALLY enjoy my little girl, she is helpful with her brothers, she loves to learn and I would miss her like crazy. It might have been a different story if my boys were the oldest! :) Plus we do school when we want to, if I need to sleep in because I am pregnant and exhausted, that's fine-we don't have a bus to catch. If she is feeling sick-she doesn't have to miss school, we can still do it. If either of us is just having a busy or an off day-we can work school into or around it. We can take breaks when we want to, just to make cupcakes, or watch a movie and then get back to it when we feel more into it. She learns when she is ready to learn, not when the clock says it's time, and that has helped a lot. Question #2-Where do you get your outline for homeschooling? Basically up until a couple weeks ago-I just pulled things from wherever. We learned about what we wanted to. We try to go to the library here in town at least once a week and get new books about what she wants to learn about, and videos that go along with it. You can find everything you need on the Internet too, so we did a lot of researching and playing on the computer. What I focused on though, is teaching her to read. My theory is, is if she can read-she can learn anything and everything. She can get a book on any subject and learn it. If she wanted to learn rocket science she could, as long as she could read it (and comprehend it of course). So we focused on just reading a lot of books, learning sight words and reading everything we saw. It just seemed like overnight she went from reading signs around town that said stop and one way to ones like library and pharmacy. She caught on very quickly when we started focusing all of our energy on it-and now she sits and reads over my shoulder while I type-or will sit and read her brothers books while I'm making dinner. Okay-so this answer is getting long. About a month ago, I decided we needed more structure now that she can read, and now that I am pregnant and not feeling like doing much during the day. I needed some accountability, and she needed some challenging work. I found out about Connections Academy-which is an online virtual public school. Which means it's free. (Yeah for us, the poor students). She is getting a stellar education-she is learning about fractions, soil, and how to write a letter in kindergarten! They let your advanced students fly ahead to where they are being challenged, and then allow you to take it slower with subjects they need a little more time with. They sent us a computer to use just for school, which is nice that she is not monopolizing mine. They also sent crayons. 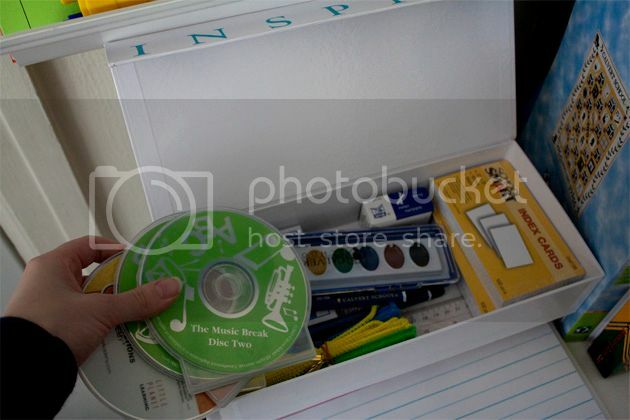 paints, arts and crafts things, music, math cubes-you name it they sent it, all free of charge. A lot of it is from Calvert Academy which is a private online school that I looked into and it was going to cost over $1000 to get her enrolled...something I just couldn't swallow. She also will do all the state standardized testing, and since she is enrolled in public school...I don't have to worry about truancy officers knocking on my door. Question #3-What kinds of things do you do? Answer #3-I still like to do our own thing for school on top of the awesome curriculum that we are doing. Every morning we sing a song, have morning prayer, say the pledge of allegiance, read a scripture or inspirational story and work on our time line. Then we log onto her school website and go down the days schedule. We made the schedule so we chose what days we were going to do each subject-some subjects like math and language we do every day. I try and have all the worksheets and materials that she'll need for each lesson in a folder at the beginning of the day, so that when we get to that lesson she has it there in front of her. The nice thing about the curriculum, is that a lot of the subjects mesh together, so while we are reading books about weather and the earth, we are doing science, math and activity lessons about soil, thermometers and things to do in different weather. It takes about 3-4 hours a day, most of which she doesn't need to be managed since she can read the directions herself. I am just there to give her encouragement and answer any questions she has. It's super fun to see that she is gaining her independence, her self-esteem and her knowledge of all of these things in my own home. I get to be the one to give her a gold star when she does a great job. Plus, now my 3 year old is starting to get a little more of an attention span, so he will follow along for a good portion of the day-and do some "homework" of his own. He really likes it when his sister is the "teacher" and shows him how to do things, and that makes her feel good too, when she can read the directions and teach him something. I know home school isn't for everyone, but for me I honestly can't imagine another way. Sure it would be nice to have time for myself-but with all these littler ones, right now it would just be harder if I sent the one good helper I had away for 7 hours a day! (We have full day kindergarten here).